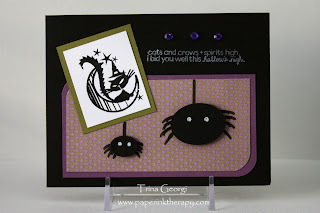 Paper & Ink Therapy: Happy Halloween! Lots to do today to get my little butterfly and zombie ready for tonight, so I'll keep this short. I have one last Halloween card to share, and then a little tribute to one of my favorite writers (which I think is fitting for a day like today). Here's my card for today (ignore the hairy spider legs...lol).